Our Get HYPE Philly! teens recently built environment-friendly pizza ovens to reheat leftover pizza. All you have to do to make your own is hang on to your delivery box! They also learned how to cook a pizza-inspired recipe that will make you rethink pulling out your wallet and ordering delivery. At these programs, teens discussed the differences between fossil fuel energy and more sustainable, alternative energy sources such as solar energy. Teens talked about practical ways to reduce energy use, especially from unsustainable sources, as they created a solar-powered pizza oven from a pizza box! Take a look at their innovative, environment-friendly pizza ovens. After building the ovens, teens prepared Pizza Quesadillas made with plenty of healthy produce, to test out their solar-powered pizza ovens and satisfy their taste buds. Here's our pizza recipe. Try it out for yourself! *Place ingredients in food processor, until garlic and basil is finely chopped. *You can fold over 1 large tortilla or sandwich your ingredients between 2 small tortillas. Save extra pizza sauce for a dip! *Feel free to add any fresh produce that is tasty to you! Lightly brush both sides of a large tortilla with garlic sauce. Spread on pizza sauce, cheese, and toppings. Cook tortilla is golden/lightly browned (be sure to flip the tortilla to cook on both sides). Cut into 2-3 pieces and Enjoy! Get HYPE Philly! 's free culinary literacy programs happen from 3:30 p.m. to 5:30 p.m. on Tuesdays and Thursdays at several free library locations. We encourage anyone ages 12-18 to come check it out! Download our Get HYPE Philly! Programs Calendar or browse for our events online. And don't forget to Follow and Like us on Facebook, Twitter, and Instagram! Get HYPE Philly! is an initiative made up of ten organizations including the Free Library of Philadelphia, with a mission to empower Philadelphia youth as leaders, focusing on Food Education, Urban Agriculture, Physical Activity and Work Readiness. While each organization holds unique events to promote the focus areas, GHP! initiative partners often collaborate to achieve multifaceted experiences for youth participants. 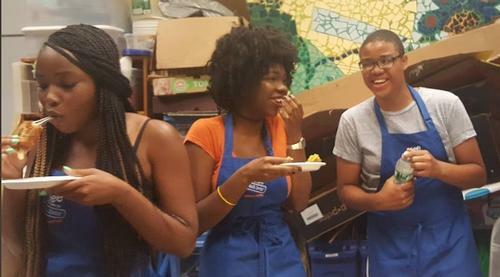 Youth ages 12 - 18 come to several Free Library locations in North Philadelphia, as well as Parkway Central Library, to participate in a free, drop-in culinary literacy program where teens can expect to eat food and have fun! This is a good idea in getting teens, young adults, and elderly into good eating habits. Add a Comment to Powered-Up Pizza!